EADERS may have noticed that the Papal Resignation and Election has not been covered very much on “Views from the Choir Loft.” There is a perfectly good reason for this: we do not want to add to all the confusion that already exists! In other words, in the various news media outlets and internet blogs, there has been much information disseminated . . . but most of it is nonsense. How do I know it’s nonsense? Simply because I have a friend who worked at the highest levels of the Vatican for many years, and this friend has specifically told me as much. 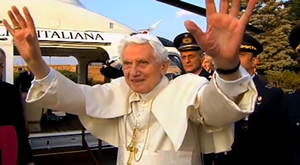 Finally, for myself, I wish to say one more time that it is hard for me to imagine a more saintly, intelligent, brave Pope than Benedict XVI.